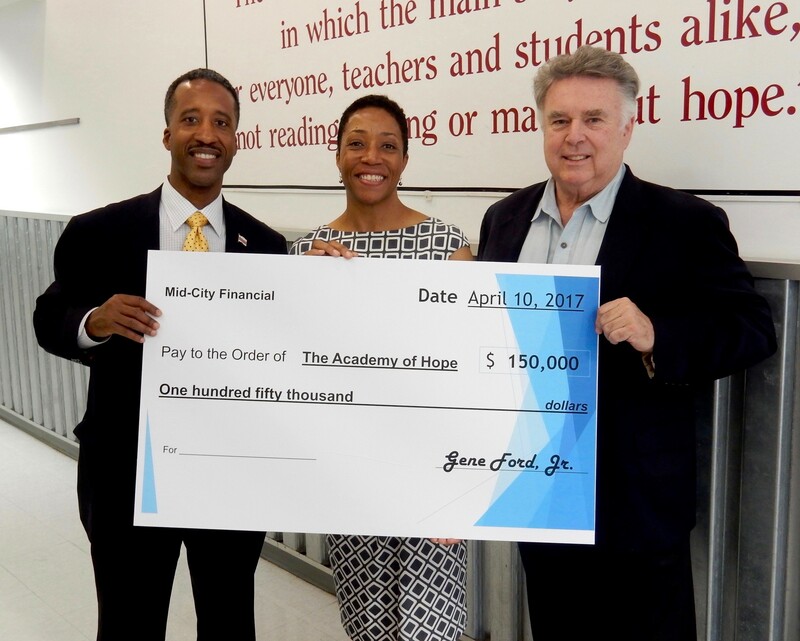 Washington, DC (April 2017) – In keeping with its history of supporting District social services and adult learning programs specifically, the head of MidCity Development today presented the Academy of Hope with a check for $150,000 from the estate of Eugene F. Ford, Sr., the founder of Mid-City. MidCity Chairman of the Board Eugene F. Ford, Jr. made the presentation in person, presenting Academy of Hope Chief Executive Officer Lecester Johnson with an oversized check while District Ward 5 Council Member Kenyan McDuffie joined in to salute the generous contribution. Ms. Johnson noted that the contribution adds to years of support from the Ford family, including a 2016 contribution of $200,000 towards the Academy’s workforce development initiatives. Academy of Hope provides a variety of programs and services to meet the needs of adult learners, and this contribution is an “exciting and welcome addition,” said Ms. Johnson. From left to right, D.C. Ward 5 Councilman Kenyan R. McDuffie, Academy of Hope CEO Lecester Johnson, and Mid-City Board Chairman Eugene F. Ford, Jr.
MidCity is family-owned and mission-driven, firmly rooted in a pioneering spirit and 50 years of excellence in the development, acquisition, oversight and management of multifamily housing and mixed-use real estate. The company is committed to strategic growth and fiscal strength while also staying true to its tradition of social responsibility. 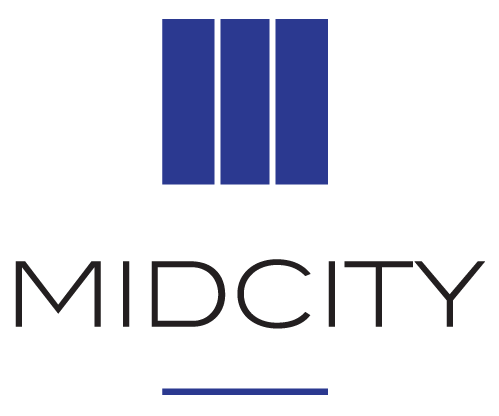 MidCity was founded in 1965 by Eugene F. Ford, Sr., an engaged leader and community advocate with a visionary approach to delivering quality multifamily housing to support the diverse needs of local communities. 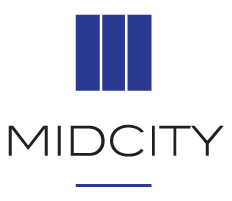 The company has developed more than 15,000 apartments across the country, primarily in the District of Columbia and Maryland. Academy of Hope creates lasting impact in the community by offering tailored educational services for adults who, due to low-literacy and insufficient basic skills, are not able to find or retain living-wage employment and are often trapped in a cycle of poverty. Academy leaders believe education is transformative and the first crucial step in breaking the cycle of poverty. Their mission is to provide high quality education and services that change lives and improve our communities. Academy of Hope was founded in 1985 by two teachers who believed that education could empower those most marginalized in Washington, D.C.